The cupboards one finds already installed in a house are not distinguished usually by any particularly decorative features, and, in consequence, they give a commonplace appearance to the room, or, if large, are obtrusive. The old-fashioned plan of fitting a pair of plain cupboards, one on each side of the chimney-breast in the dining-room, rising from the floor level to some 3 feet 6 inches high, and finished with a mahogany top, has little to recommend it on the score of appearance. Its usefulness, however, cannot be denied, which probably is the reason why it has become an established institution in low-rented houses, particularly in the country. The mahogany top, designed to serve as a sideboard, more often than not is laden with a heterogeneous collection of flotsam and jetsam that could well be spared or put out of sight. At little expense these cupboards may be raised so that their bases come so me where near where their tops formerly stood. So arranged, they lose their commonplace appearance, and are at a more convenient level for access. No longer is it necessary to trouble the occupant of the adjacent easy-chair to rise when it is desired to search for something. The recess created beneath the cupboard becomes useful for accommodating the coal-scuttle, or some other small piece of furniture. The illustration affords a suggestion for making the alteration in a way to secure these advantages. Incidentally, this alteration affords also an opportunity for improving the design of the cupboard. This, it will be seen, consists in adding a simple pediment, in fitting mouldings to the panels, and in supporting the whole on ornamental brackets in the manner shown. Painted to agree with the general decorative treatment of the woodwork, a cupboard of this kind constitutes quite a pleasing feature in any room. 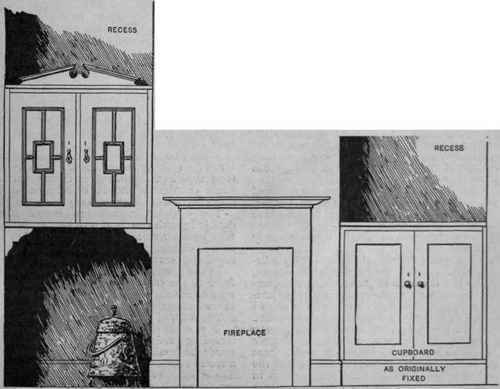 The illustration shows one original cupboard on the opposite side of the chimney-breast, for comparison with the one treated as suggested, and the improvement that can be effected may be seen at a glance. On hygienic grounds alone, cupboards used for the storage of food are best arranged so as not to open near to the floor level, where there is always greater opportunity for the dust and dirt to gain access to them. In the drawing-room a cupboard similarly Placed, but provided with glass panels, makes a useful and suitable receptacle for old china or other treasured chattels. Just how far the housewife may decide to add cupboards to her rooms will depend on her views on the question of expenditure, after she has taken into account the terms on which the house is held. If on a short tenancy, of course all such outlay is for the ultimate benefit of the landlord, but even then it may be worth while. When the occupier is also the owner of the house, the circumstances generally fully justify the expenditure. In bedrooms the same problem may arise, and it is safe to say that no bedroom is complete without its cupboard. Opportunity often occurs for the fixing of cupboards upon landings, in staircase recesses, and other odd corners of the house where suitable spaces exist. In the kitchen, as a rule, there is rarely sufficient shelving. The cooking utensils, china, and other indis-pensables occupy every available surface, and when it comes to jam-making the question is sure to arise - where can the jampots be stored in a dry and suitable place? A supplementary cupboard well furnished with shelves is just the thing. When the expense of fitting cupboards is not considered to be worth while, there still remain other ways of treating the recesses one finds in most rooms so as to add to the comfort and general convenience of the household. A set of shelves arranged so as to serve a triple purpose is a most useful adjunct to any sitting-room, and as it may be made, fixed, and painted for about £2, the outlay is trifling. . The central section can provide accommodation for books. The upper part may serve for the display of decorative pottery or other bric-a-brac. The lowermost section can be.used for storing the housewife's work-basket, children's school-books, the magazines, and other things that the orderly person would wish to keep out of sight. A cretonne curtain, running on a brass rod, can be used to close this section so as to keep the things concealed and free from dust. If preferred, the book-shelves also could be fitted with curtains, one pair being made to cover all the shelves. In the drawing-room, where usually a picture-rail is found, a shelf may be fitted in one or both of the recesses on either side of the chimney-breast, thereby providing accommodation for a collection of china, pottery, or other treasured belongings. A board seven inches wide, cut to the correct length and painted to match the other woodwork, will rest securely upon the picture-rail without any further special fixing. Its cost should not exceed 3s. If required for plates, dishes, or other like objects, it is well to have it grooved on the upper surface like a dresser-shelf. 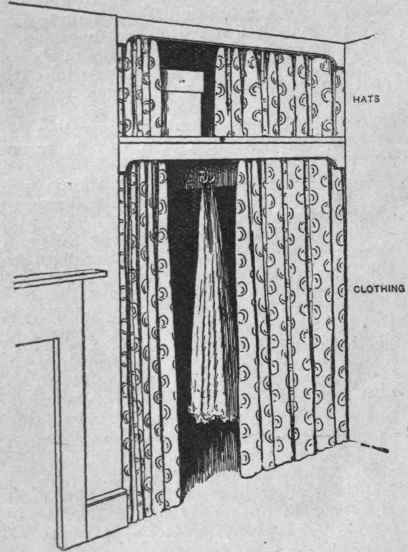 In the bedrooms a similar device may be made to constitute a useful receptacle for clothing - a supplementary wardrobe. The illustration shows how this simple fitting is made. The shelf, which should be wide enough to occupy the full depth of the recess, is fixed at such a distance from the ceiling as will leave sufficient space above it for the accommodation of millinery boxes. Beneath it on the wall surface, at back and sides of the recess, boards some six inches deep are fixed. Primarily these are the supports for the shelf, but they also provide a surface to which a series of wardrobe hooks may be attached. From nine to ten inches apart is a good distance for spacing these hooks. If the recess is of sufficient depth, two or three revolving triple coat-hooks should be screwed to the lower surface of the shelf along its centre line. The curtains, which are better made double in each case, are provided with rings four inches apart and three-quarters of an inch in diameter, and run on half-inch brass-cased rods carried in sockets at each end. In the illustration drop boards are shown fixed to the ceiling, and to the lower front edge of the shelf. These are for the purpose of excluding dust, and also look well. The rods, of course, run behind them. The cost of the necessary woodwork, including rods and their brackets and wardrobe hooks, should not exceed 25s. for a recess of five feet in width. To be continued.